Here in hot and steamy Singapore the Chinese New Year Celebrations have been evident everywhere. For a whole week after February 15th the Drummers and Lion Dancers have been performing in shopping malls, offices and condos, bringing good luck for the Year of the Dog. 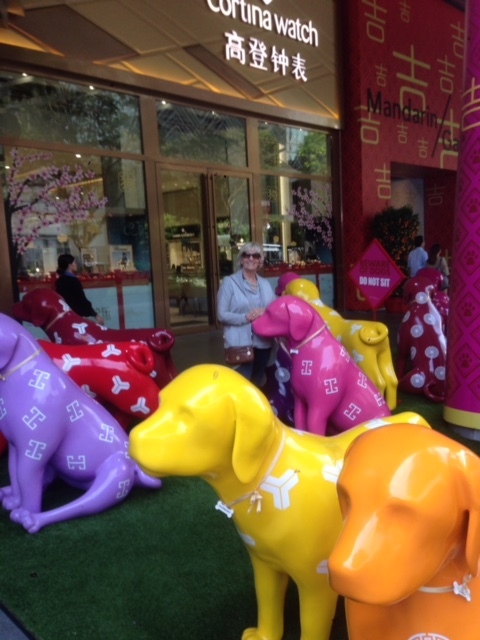 I joined a group of Dogs in Orchard Street, which have been bought by locals to support a voluntary dog shelter. Sadly, they are too large for my suitcase, though my daughter has bought one and hopes there is room on her balcony. 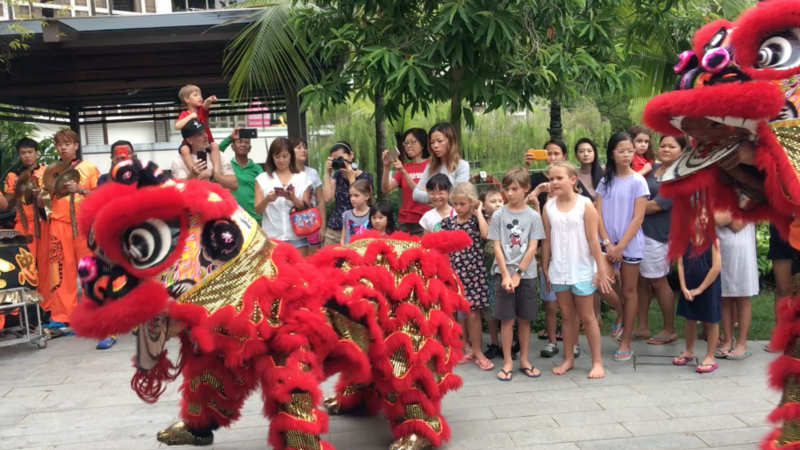 In our Condo last Saturday, a group of excited children and adults awaited the arrival of the Dragon and the Lions. It was fun to witness the agility of the dancers. The Lion finally settled over the offerings, a dish of tokens, mandarins and lettuce. In the heat I imagined the feverish peeling of mandarin oranges that went on under the costumes. Finally, the lettuce leaves were thrown out to the crowd, to squeals of delight. The Lion rose to reveal the mandarin segments arranged in a New Year’s luck symbol. A scroll was presented to the Management and, trusting in ancient tradition, all will be well for another year.